Confetti Park: Mardi Gras Indians, Brass Bands, Piano Profs! Every city that celebrates Mardi Gras has its own special customs, and in New Orleans, we have a few unique aspects… such as the Mardi Gras Indians. Neighborhood tribes wear fabulous towering costumes made up of colorful feathers and beads…. the Big Chiefs battle for who is the most beautiful on a Mardi Gras Day. 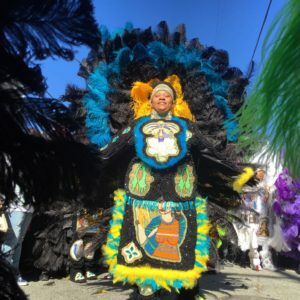 One of the songs I play today is famous across the world, but what you might not know is that it came from the New Orleans Mardi Gras Indian tradition. This song “Iko Iko,” performed by the Dixie Cups, tells the story of two warring Indian tribes who have a confrontation in the street. I also play “My Indian Red,” a very famous Indian prayer, performed by the Baby Dodds Trio. On Fat Tuesday, we will hear that sung on the streets of New Orleans from sunup to sundown. And there are other songs sure to be played along the parade routes where families will be camped to catch beads. Joke of the Day – Ash Who? This episode also features The Cajun Cornbread Boy by Dianne De Las Casas at Storytime. Coming soon to KBOG 97.9 FM Bandon Community Radio in Bandon, OR. Stay tuned!